Welcome Kendra please tell us a little about yourself. Thank you for having me! I’m currently undertaking the MLitt in Creative Writing through Glasgow University and I live in London with my husband and two cats, Othello and Cleo. I’m originally from California and go back to visit the States as often as I can as I miss home and family. When will your E-book be coming out and where can people find it? Please tell us a little about your novel? The current release date for my novel is set for the 7th of March. You’ll be able to purchase a copy from the Pilrig Press website, http://www.pilrigpress.co.uk/books.html The novel is set in 19th century Sweden and is about a young woman who emigrates to America, and the events that propel her towards making that decision. It is told through the prism of a Swedish fairy tale, hence the title. 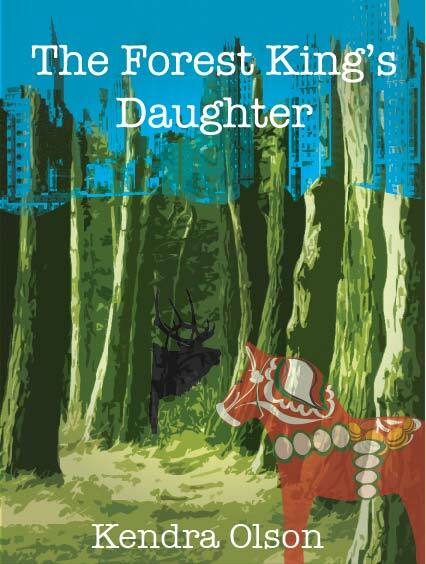 What inspired you to create The Forest Kings Daughter? After I moved to London I felt very lonely for my family back home in the States. Shortly after my grandfather died, in 2010, I decided to look up my relatives in Sweden. My great grandmother emigrated from Sweden to America in 1891 and my grandfather was one of our last surviving (American) relatives who grew up speaking some Swedish at home. I visited Sweden in 2011 and began learning more about this grandmother. She interested me as she’d left Europe never to return and here I was returning, over 100 years later, as a young woman. It was a family connection I had forgotten about. I wanted to explore what went into such a decision. However, I never did find out and Ingrid’s story stems purely from my imagination. I live in a very small flat and so I nearly always write at the table in our living room. I’d like to say the editing, but if I’m being honest I enjoyed the research element of it the most. I found it very easy to get lost in other people’s stories and the minute details of life in a bygone era. I don’t know! That’s an interesting question though. I think I most enjoyed ‘playing God’, so to speak, in my characters’ world. Thank-you very much Kendra for taking time to do this blog interview, it has been a pleasure to hear about your novel. I for one can’t wait to read it. I wish you well with your novel and all other writing projects you may undertake in the future. Thanks for having me Katie! And all the best with your novel, Finding Destiny. I can’t wait to read it! I’m so looking forward to read both books! Thanks Hun, I really enjoyed having Kendra on my blog.. Thanks Hun, it was lovely to have Kendra on my blog… I too can’t wait to read her book..